Coastal Clean-Up Day Saw PE Residents Rally! Saturday 19th September was International Coastal Clean-Up Day. All over the world beach clean-ups were organised in an effort to reduce the amount of garbage and plastic pollution that plague our oceans. Each year 8 million tons of plastic is dumped into our oceans, 80% of which comes from land, and this figure is expected to grow as the use of plastic grows. This pollution is having an extremely detrimental effect on the marine eco-system and the animals that inhabit it. Over 250 species have been known to have ingested or become entangled in plastic, which easily leads to death. Beach clean-ups are one of the easiest ways for anyone to have a positive impact on the marine environment. By reducing the amount of garbage on our beaches we will reduce the amount of garbage in our oceans. 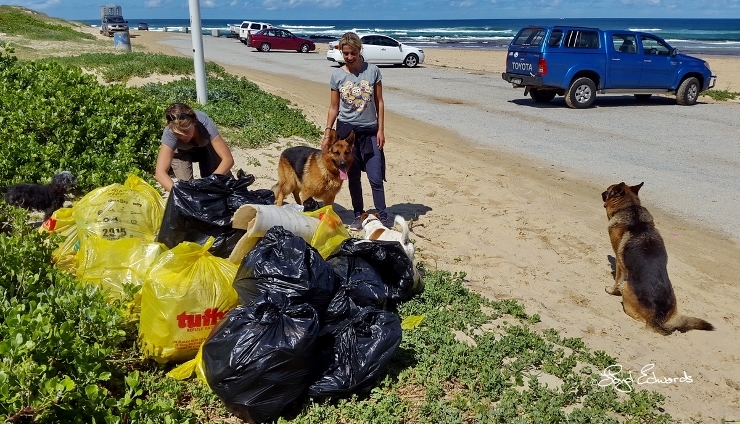 So it was incredibly impressive to see that the community in and around Port Elizabeth put together not only one beach clean-up for the international event, but several clean-ups all along our coastline! It started with WESSA (The Wildlife and Environment Society of South Africa) involving primary school kids. 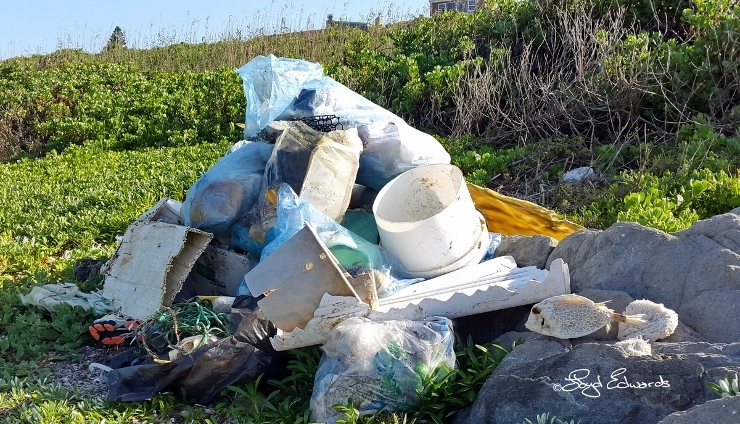 They removed 147kg of rubbish from the Swartkops river estuary on Wednesday 16th September, and another 536kg around the lower Baakens river on Friday 18th September. They found a large amount of stripped plastic cabling that had been dumped in the water by copperwire thieves, and also removed an exceedingly heavy double mattress and a one hundred kg truck tyre. Then on the Saturday itself The Unity in Africa Foundation organised a clean-up of First Beach/Pollock Beach in Summerstrand. The Algoa Bay Hope Spot committee was joined by the Four Wheel Drive Club (sporting the banner "In Support Of A Cleaner Environment") and together collected approximately 6 tons of garbage and debris of all sorts between Kini Bay and Gamtoos river mouth. 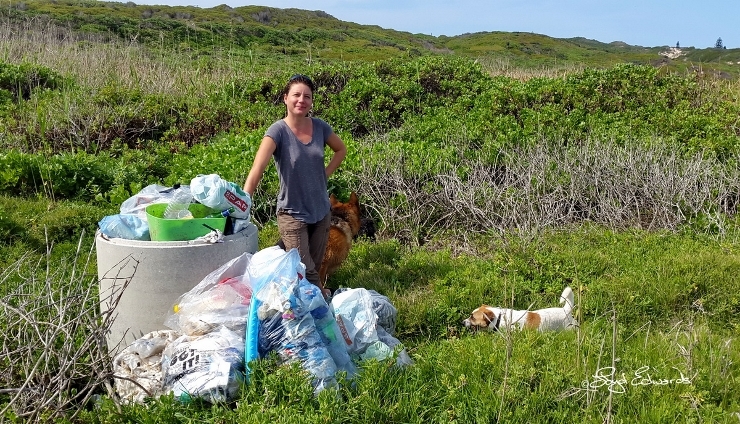 Lastly, the Friends Of Schoenmakerskop cleared their area of 20 bags of beach litter and the beaches in the Cape Recife Nature Reserve were all cleared! This was a proud moment for Port Elizabeth; to see residents actively keeping our Hope Spot beautiful and healthy by helping remove so much plastic, fishing lines, ropes and other pollution from our beaches. Our bay was launched as a Hope Spot in December 2014, due to its incredible marine biodiversity and important conservation status. The most important objective of the Hope Spot initiative is to encourage the local community to care about the environment they are living in. It was amazing to see how this message has clearly taken off throughout the city. If communities can work together to keep their own coast clean then all of the world’s oceans may start to benefit! © Raggy Charters - 2019 | Links | Coastal Clean-Up Day Saw PE Residents Rally!